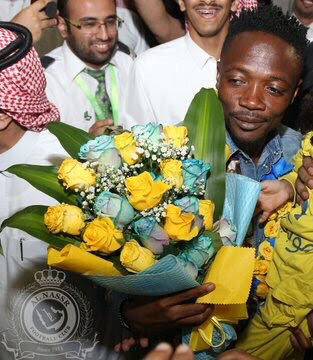 New Al Nassr FC new signing, Ahmed Musa, is ecstatic at the amazing reception he received from the club’s teeming fans on his arrival at King Khalid International Airport in the Saudi capital Riyadh on Friday, reports Completesportsnigeria.com. Musa joined the club on a four-year deal four-year deal reportedly worth an initial £14.8m, which could rise to £25m after his brilliant performance for the Super Eagles at the 2018 FIFA World Cup in Russia. The 25 year old struggled to pin a regular place in the starting lineup of Leicester City following his arrival from CSKA Moscow in 2016 for £16m, a then club record fee paid by the Foxes. What an amazing reception here in Saudi Arabia,” he tweeted on Friday. “I want to thank each and every person who came out and welcomed me at the airport. One of the Musa’s two goals against Iceland emerged as the eighth best goal of 2018 World Cup in Russia. He scored twice in three games for Nigeria at the 2018 FIFA World Cup in Russia.